Can't go to Carole's without playing games. 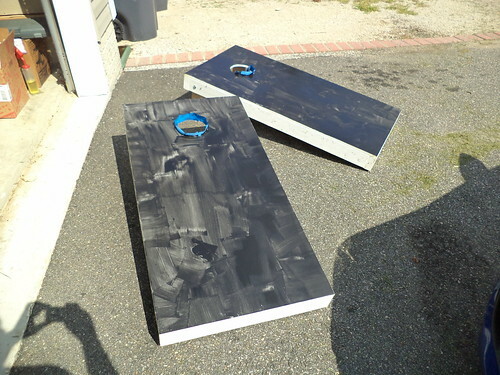 It started with the creation of a "Corn Hole". I looked at Larry. "A what?" I asked. 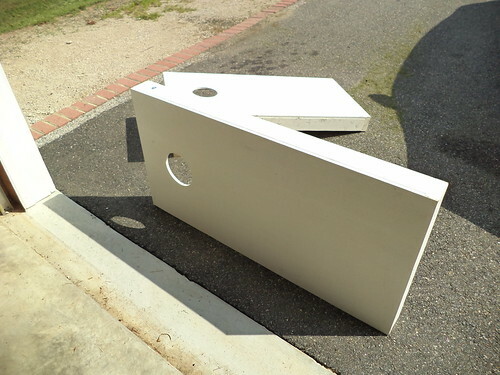 "A Corn Hole," he replied, as if telling me again would make me understand it better. Out to the garage we went. Once I saw these, I knew what they were for. 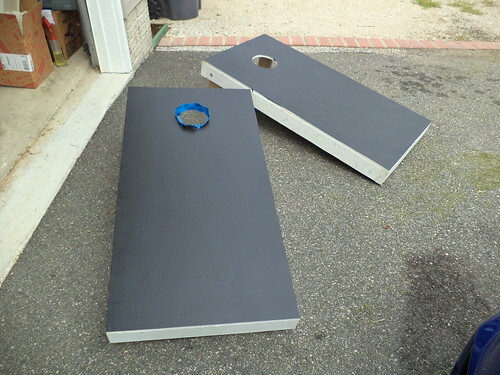 We would call the whole thing a "Bean Bag Toss" set up. The object of the game is to toss a bag full of beans or, in this area of the country, dried corn kernels, into the hole from a distance. 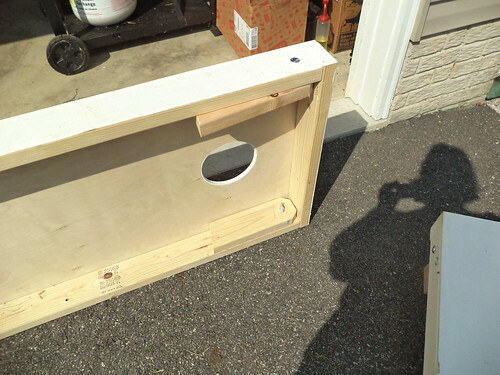 You get 3 points for getting the bag through the hole, 2 points for getting the bag on the top quarter, near the hole, and 1 point for getting the bag on the bottom of the ramp. Larry had seen these at a store but they wanted an exorbitant amount of money for them. So he and his dad built their own. The rectangle has two feet at the top which fold out to give the piece its slant. This one was a little wobbly on the driveway, but once in the back yard, it was fine. My job was to paint chalkboard paint onto the top so topical items can be drawn or written on the face. It was warm on Friday morning when I did this. Larry didn't want the sides or the interior of the hole to be be painted so there was blue painter's tape to edge those areas. I could not get the blue tape to stick to the sides. It worked for a bit with the interior of the hole, but I gave up on the one and just did my best to not have it drip. This was the first coat. It took a bit of mixing to get the paint to come out evenly. Ultimately, it took three coats to get an even surface. I brought sidewalk chalk along but that was too hard for the surface and I had to paint over the markings. You need to use chalkboard chalk on this paint. The can recommends a drying time of 24-hours so I painted this on Friday as we were going to use them at the 3rd Annual Spectacular Death Guild Meet-up, held on Saturday. By Saturday, they were ready to go. 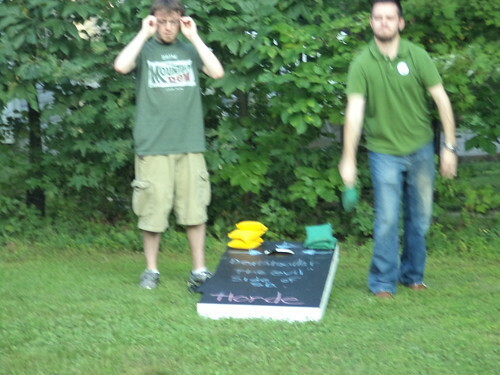 In this blurry photo of Larry and Luke, we had a great time playing "Corn Hole". It was hot and humid so we wound up not using these as much as I think we would have had the humidity not been so oppressive. The chalk markings erased very easily. 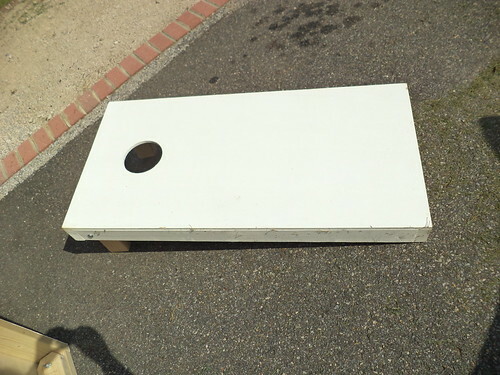 When the bean bags would land on the ramp, they would erase the chalk. 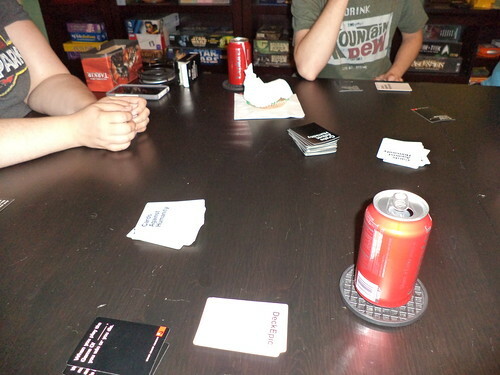 Late Saturday night, we played Cards Against Humanity. 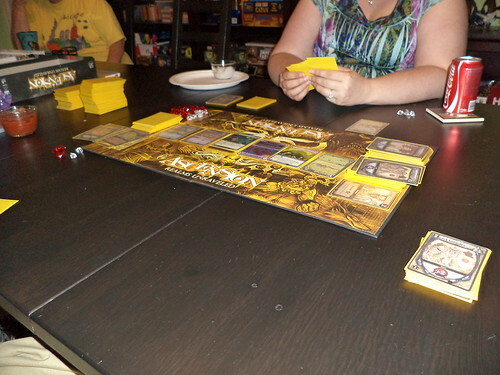 On Monday evening, we blocked off the whole evening and played three games. 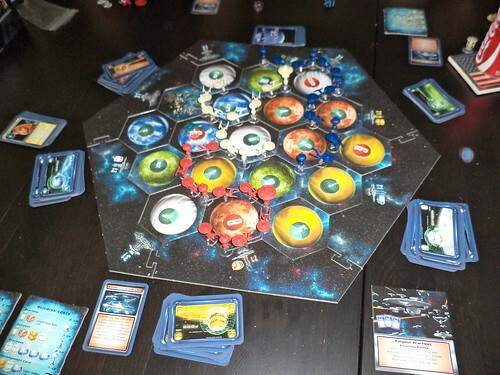 First up was Star Trek Catan. It took me a little bit to remember how to play Settlers of Catan, but once I remembered, this plays exactly like Settlers. Your pieces are the Enterprise space ship and Federation space stations. Carole won this. Next up, we played Ascension. I'm not one to enjoy card games where you have strategies utilizing various cards. Magic: The Gathering and Blizzard's Hearthstone card game are like that. Ascension is similar but it's easier for people like me to figure out. It was fun. It might be something I'd enjoy doing on a regular basis. Larry and I played Pirate Munchkin on Sunday afternoon. I do like that game, mainly because the cards are hilarious. I believe Larry won this round of Ascension. Carole said there is an Ascension app for smart phones. She spends a lot of time playing the game on her phone. I looked at my smart phone and shook my head. I use my phone to make and receive calls, occasionally check the weather and find mapping routes, and as an alarm clock when one is not available. Play games on it? I don't think so. 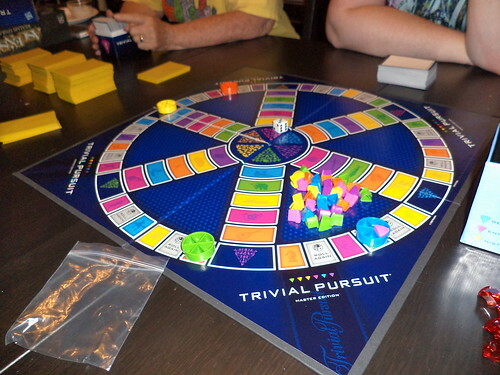 We ended the night with my favorite game, Trivial Pursuit. This was the newest version, the one Larry gave Carole for Christmas. Mom joined us and we played the fast way where you got a pie piece when you answered a question correctly. I won. I'd been stumped by the green Science and Nature category so they thought that was a good one to give me at the end. My question? "What kind of dog was Lassie?" I thought, at first, Larry, who was giving me questions, was joking. I was really expecting something along the lines of "Name one of the nobel gasses." I'd have had to actually think about that. It was kind of disappointing to win on what, to me, was a hugely easy question. Oh well, it was still fun. I've been playing Dungeons and Dragons online with a group of friends since May. I just added a table top Dungeons and Dragons event which may play as much as twice a month, but right now, we're looking at just once a month. Years ago, bi-monthly gaming dates with friends was a part of my life. Games are a way to connect and have fun. It's slowly coming back into my life and I couldn't be happier.